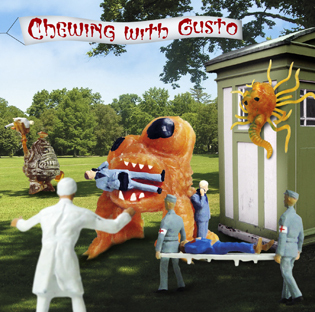 CHEWING WITH GUSTO is the joint project of two most diverse and distant musical entities sharing the same adventurous spirit, Chewing Magnetic Tape and Gusto Extermination Fluid. Chewing Magnetic Tape is a musical project involving a number of artists from various places. Gusto Extermination Fluid is the solo project of British electronic and computer musician/producer Paul Taylor. Chewing With Gusto Vol. 1 contains 7 tracks, each combining CMT’s raw and fuzzy blend of experimentalism, psychedelia and pop music with GEF’s lush electronic treatments. The resulting compositions deliver an intriguing sense of strangeness with a unique epic edge, like parade music of alien civilizations.